Globally, derelict fishing gear makes up at least one tenth of all marine litter, equivalent to 640,000 tons a year. Derelict fishing gear has large-scale impacts on marine biodiversity through habitat disturbance and the effects of ghost fishing. It causes direct harm to the welfare and conservation of marine animals via entanglement and/or ingestion. It acts as a source of, and vehicle for, persistent toxic chemical pollution in the ocean and represents a threat to human health, for example, to scuba divers and to maritime traffic through propeller entanglement. There are also significant economic costs associated with derelict fishing gear. The adverse impacts of derelict fishing gear have been exacerbated by the introduction of non-biodegradable fishing gear, with many of the plastics used predicted to persist in the marine environment for up to 600 years. The cumulative long-term effects are likely to be extremely damaging to marine flora and fauna, as well as to the people and industries who depend on healthy seas. The Healthy Seas initiative applies a two-way approach to achieve its mission. Namely, recovering ghost fishing nets from the seas (with the help of divers and salvage companies) and preventing waste nets from ending up in marine ecosystems in the first place (with the help of fishers and fish farms). The Healthy Seas initiative, “a journey from waste to wear,” was founded by a nonprofit organization (Ghost Fishing Foundation) and two sustainable businesses (Aquafil Group and Star Sock). Its mission is to remove waste from the seas, in particular fishing nets, for the purpose of creating healthier seas. 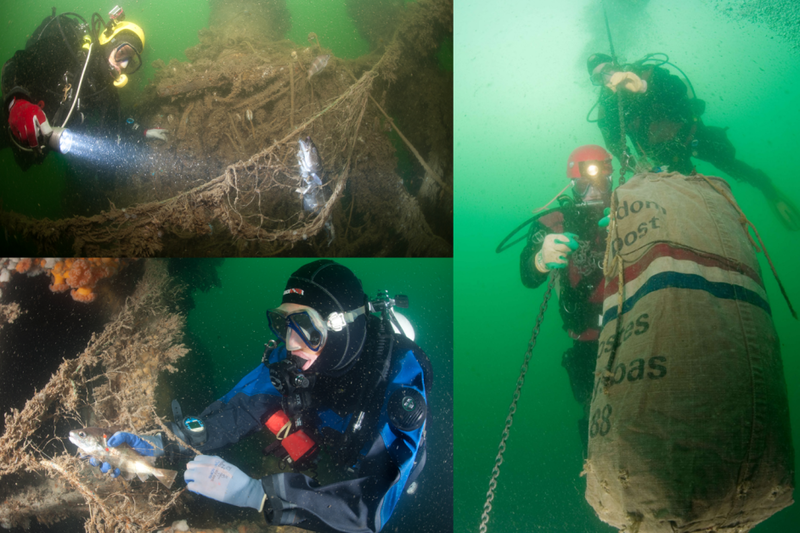 Ghost Fishing volunteer divers recover ghost nets from the North, the Mediterranean and Adriatic Seas. Healthy Seas also collaborates with fishermen, fish farms and local communities to prevent waste nets from ending up in the sea. Raising awareness of the environmental damage caused by ghost gear and promoting the ecological and economic importance of healthy seas is also a very important part of its work. The recovered nets, together with other nylon waste, are transformed by Aquafil into ECONYL® regenerated nylon yarn, a high-quality raw material used to create new products, such as socks, swimwear, sportswear and carpets. It has the same quality as virgin nylon from fossil raw material, it can be infinitely recyclable and can unleash endless possibilities for interior and fashion designers, creators and consumers. Since the launch of Healthy Seas in 2013, 453 tons of nets have been collected in cooperation with divers and fishing communities, the equivalent in weight of 3 blue whales. Most fishing nets are made from nylon, a valuable engineering-grade plastic which can be regenerated and used in textile products. 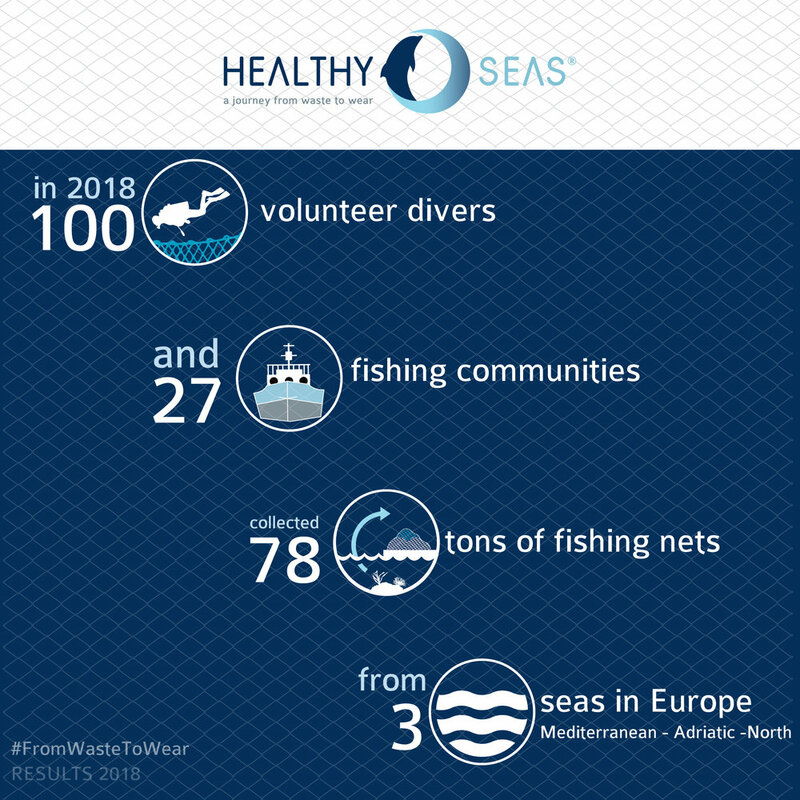 The strength of Healthy Seas lies in its partnership of NGOs and businesses working towards the same goal: a better planet and healthier seas, while learning-by-doing and being open to new partners and creative ideas. Sustainability is the focus from both an environmental and economic point of view. Effectively tackling the problem of derelict fishing gear and marine litter more generally will clearly require long term, coordinated action at the local, regional and global level. Healthy Seas is a successful industry-NGO collaboration initiative representing a sustainable and self-financing solution, which has the potential to be expanded and replicated more widely.